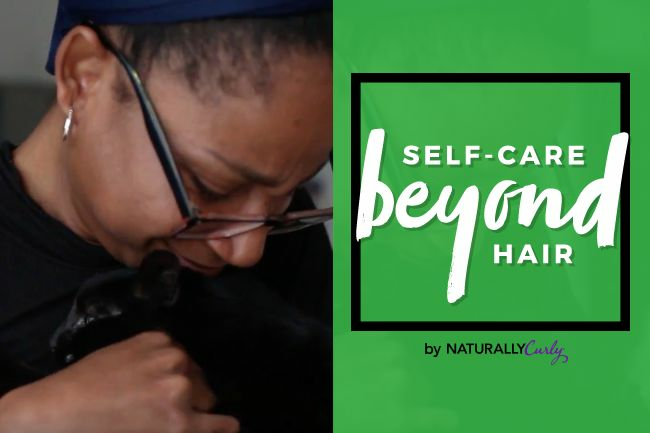 This month on NaturallyCurly we're going to be talking about self-care beyond hair, so we'll be sharing our own personal self-care practices with all of you over the next few weeks. In our first episode, our Senior Copywriter, Gerilyn, shares her passion for volunteerism. You may think of self-care as time that you have to spend by yourself, but Gerilyn has found that offering her time in the service of others is what helps her keep negative thoughts at bay. In addition to working on our brand partnerships, Gerilyn also spearheads our Meals On Wheels company initiative. Thanks to Gerilyn, NaturallyCurly team members deliver meals to those in need every week. Yes, she's awesome. So I wanted to find out how she found this self-care practice and what keeps her going. Do you ever have moments where you just don’t feel like going, or you feel too busy for self-care? How do you deal with those moments? Absolutely. Then I remember, this person doesn’t have the ability to walk this dog or take their beloved cat to the vet. I have that ability. I need to help them take care of the pets that are keeping them going! Now, there are times when I cannot commit to a dog walking session or pet care drop off because of work or life. When that happens, I remember that it’s okay: I’m not Superwoman, but I can use that time another way. In such case, I drive a delivery route with my coworkers for Meals on Wheels of Central Texas. We drop off meals to disabled and senior citizens in our neighborhood. So, I simply reroute my focus and think about where I can steer the wheel of goodness! Because in the end, we can only do so much as individuals, and that’s an important part of self-care: understanding your limits and establishing boundaries. How did you find an organization that you felt passionate about? My passion for Meals on Wheels was borne out of a long-held respect for their organization. Growing up I saw volunteers from the organization knocking on doors, boxed lunches in hand and smiles on their faces. It was quite the impression, but I didn’t have a full grasp of why their presence in my neighborhood was important until I got older and realized that not everyone has the fortune of eating food. Isn’t that something? So, Meals on Wheels has always been a backing track in my life’s soundscape. For them to offer volunteer opportunities outside of meal delivery was a great way for me to hone in on my passion for helping others while satisfying my obsession with cute animals. How can people who are interested in this organization get involved? The Meals on Wheels Association of America organization is nationwide. Interested persons are welcome to visit their website to find local chapters in their county. Are there any other self-care practices that you have outside of volunteering? Outside of volunteering, my self-care practice includes going to live music venues to listen to local bands and creating music with my friends. It’s hands down one of my absolute favorite things to do. Well, that and playing with my cat Sunshine Marie Jenkins. Yes. That’s her full, real name. Do you have a goal that you want to tackle in your self-care practice for 2017? I’m a firm believer in if it ain’t broke, don’t fix it. That said, there’s nothing new that I’d like to tackle per se. However, I would like to improve upon what I’ve already started. I think it’s possible to get more people involved in volunteer efforts. In order to do so, I will bring more awareness to volunteerism through face-to-face and online conversations. Stay tuned for more episodes in our self-care series, and we want to hear from you next! What's your self-care practice? Share in the comments below!